black and white tegu, otherwise known as the Tupinambis merianae in the family Teiidae. Prized for its size, it is the largest species of tegu and is also known as the Argentine giant tegu or the Argentine black and white tegu. Q: What for you are the defining characteristics of the black and white tegu, the thing or things that make them special and/or distinguishes them from other, similar creatures? Tegus are often compared to monitor lizards; what makes them different? A:Black and white tegus have black and white streaks throughout their body. They are also known for their “jowls,” the rounded parts of their cheeks. People actually like it and some say that their tegus relax when their jowls are being massaged. Q:Was it difficult for you to raise a black and white tegu? What are the best things you’ve learned about keeping it, in your experience? What challenges did you face in its care, and how did you overcome these? A: No it wasn’t difficult. As long as you give them the proper diet, ample space, and the proper respect, you’re good to go! The only challenge for me was when it rubs its nose on the enclosure… especially when it’s hungry! I had to upgrade the enclosure for more space! Q: What are their care requirements? Do they need a lot of attention? Do they need a special diet? What do they eat? What kind of exercise do they require? Will they need a special habitat? Or do they have similar care requirements as monitor lizards? A: I feed my tegu with a variety of food, from rats to occasional chicks, to chicken necks and fruits like melon and grapes. not to be bored in the enclosure. For the substrate, a nice forest floor from Zoo Med should be comfortable for the tegu. If you can mix it with repti bark, it would be okay. UV requirements. Always make sure that the UVBs you get are really effective. Watch out for bulbs that could cause eye problems, or provide insufficient UV, etc. A lot of information about this is already on the Internet. 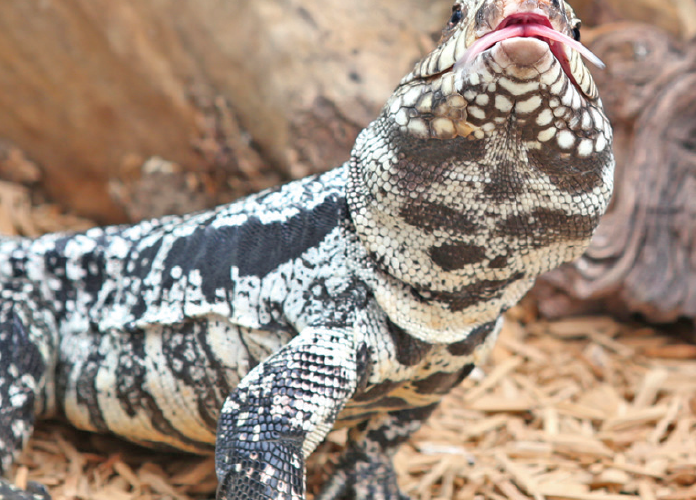 Q: What are the characteristics of a healthy black and white tegu? Conversely, what signs should keepers look out for that indicate when it is sick? What are its common health problems that keepers should watch out for? A: Tegus that are healthy should be active, alert, and always on the go for food. Common health problems could be respiratory infections and metabolic bone disease. Q: Are there misconceptions about black and white tegu that you would like to correct among those who have heard of it but who do not know it well? For example, some say it’s just another kind of monitor lizard. 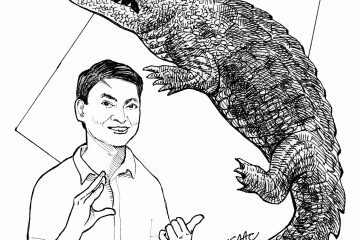 A: Well yes, tegus are different from monitor lizards. Tegus belong to the family Teiidae and are native to South and Central America. The common misconception is that are like dogs that can be tamed, or people tend to relate them to dogs. Reptiles are more complicated than dogs; they may not be defensive now and tolerate human presences, but tomorrow could be another day! Q: Can you comment on how some sites compare certain black and white tegus to dogs and cats as they are supposed to be just as intelligent and to look for human companionship and affection in the same way? A: It can look that way, but no, it’s not the same thing as having a cat or dog. Personally, I find statements like these very misleading. Tegus are very smart reptiles. They tend to familiarize themselves with the keepers, enclosures, exit points, “hangout places,” etc. But they never bark or meow at you for a decent rub or cuddle. Nevertheless, they are very nice animals and I love them for being tegus, not as dogs, nor cats. Q: For someone who is interested in keeping a Tegu for a pet, can you give them things to consider before taking the plunge? Who would they make ideal pets for? Or are they better suited to aficionados who want to study them? How much of a commitment does it take to keep a black and white tegu, and what advice would you have for someone who is keeping them for the first time? Were there any mistakes that you made as a beginner that you feel other beginners should learn from? 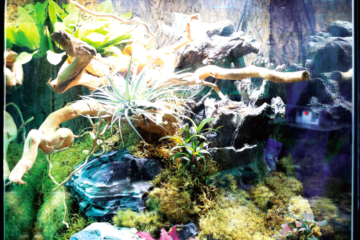 A: Commitment in taking care of any reptile should be considered a commitment for its lifetime. They have a fairly long lifespan and grow big. So better be ready with the space and the willingness to give time to it. Always be ready since sometimes, tegus aren’t in the mood and they don’t like being touched. Learn their body language and make sure that they are comfortable when being handled. 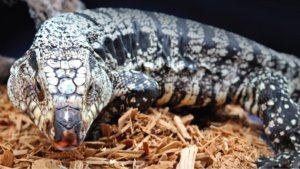 Q: Are there any risks involved in keeping black and white tegu? If so then what is your advice on how to best avoid or lessen these risks? provoked or during feeding response. 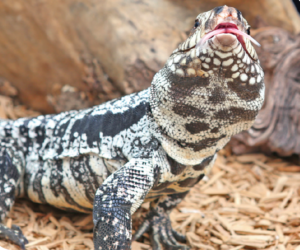 Q: What, in your experience, are the best tips for taking care of a black and white tegu? Are there any unique situations you’ve encountered and solved? A: Yes, they are able to recognize an object when it is related to food. Read up about target training and you’ll be amazed at what your tegu can do. I love it whenever I feed my tegu because it is also a form of trust building. • Habitat: Savannahs, semi-deserts, tropical rainforests, predominantly in South America (Argentina, obviously, and Brazil and Uruguay); they also like to burrow to avoid dehydration and extreme temperatures. • Diet: Omnivorous; it likes insects, spiders, wild fruits, seeds, eggs of other reptiles, and small birds it can catch. Keep an eye on its diet, as it’s a voracious eater. Keepers have also fed it raw or cooked chicken, and some advise avoiding feeding your tegu rodents, as it cannot digest fur very well. You can also supplement their diets with calcium and a multivitamin tablet (consult an exotic veterinarian or reputable breeder for help on this). • Does it hibernate? The Argentinian black and white tegu goes into ‘brumation’, which is a form of hibernation, usually from September to March. • When is it active? It is nocturnal. • How big does it get? Tegus in general grow fairly fast; keep this in mind, always! Adult males grow bigger than the females, reaching up to 140 cm or four and a half feet in length; adults can weigh up to 7 kilograms (just under 15 pounds). They typically reach sexual maturity in three years. • Lifespan: With very good care, 15-20 years in captivity. • Did you know? Tegus are excellent swimmers, and can stay underwater for fairly long periods. Also, they are born mostly colored green, but once they begin shedding, this fades to black. • Preferred temperature: Daytime, 80-90 F; basking area, 95-100 F; nighttime temperatures should be 5-10 F cooler. Also maintain humidity levels between 60-80%. You can keep a light sprayer handy for misting purposes. • Is it intelligent? It is considered to have a high level of intelligence, to be among the smartest of the large lizards, and can be trained. You will need a good enclosure for the Argentinian black and white tegu, as it’s reputed to be a brilliant escape artist. • Is it affectionate? Some experts say a few of these tegus become as affectionate as cats or dogs, but this is not the norm; our expert says you should like and respect them for what they are, and not judge them using the standards by which we judge cats or dogs. they are handled, the more attached they can become to their owners and/or handlers. • Did you know? Your tegu is highly individual, and will rearrange its habitat to its liking. Many owners like seeing what their black and white tegus do with their enclosures. • Watch it! Some keepers and breeders prefer to feed their tegus by hand; others advise that you feed your tegu using a bowl as hand-feeding may lead to it attacking your fingers by accident because it thinks your fingers are food. This is also known as ‘target-training’ your tegu. Your breeder will have the best advice for this, and the more you learn about your tegu, the better you will know which method is for you. only with breeders who can provide Department of Environment and Natural Resources certifications as to the animal’s source country, and who can competently assure you that yours is not an endangered variety. This appeared without a byline in Animal Scene’s December 2015 issue.